This past week we were kind of slackers... but that's ok because we were way ahead of schedule anyway! 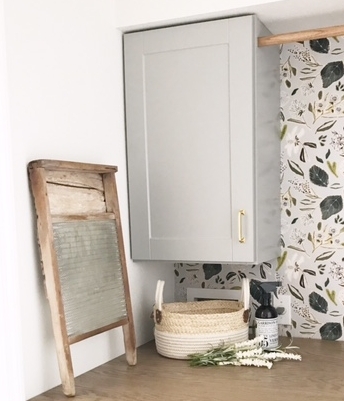 I wanted to try out the One Room Challenge with a quick and easy project and this laundry room certainly fit the bill. It's been inexpensive and pretty easy to do. That's my kind of project! Since last week, we installed the counter top, which I love!! I'm folding clothes in there even though I'd rather just sit on the floor and fold just because I can! lol The oak has such gorgeous grain and the light stain we used really makes it pop. If you like a lot of grain in your wood, oak is a really great choice. As I've explained before, to make our thick looking counter, we used oak plywood and a piece of oak trim. I think the plywood was around $50 and the trim piece was maybe $10-20. It's a really inexpensive way to get a gorgeous wood counter. We used wood glue to attach the two pieces and then put a piece of scrap wood on the front so that the clamp would be putting more pressure on the pretty trim- kind of like a wood sandwich with the front trim piece as the "meat'. Once we got it perfectly lined up, Dan told me to "Push it!" (his mistake) because then I was so annoying and kept singing Salt N Pepa's "Push It" song. I get excited during DIY projects when they're going well and sometimes that leads to me signing. Sue me. I held the wood into place while Dan got the clamps on to hold it tight over night. So we had it all in place, looking good, and I said, "I think you need to make the brace a little tighter." I was nervous that I saw a slight gap. Dan went to tighten the clamp a little more and bumped one of the braces and the piece of wood on the front fell right onto his bare foot- straight across his toes. Ouch!!! I stopped singing after that. His foot is fine- just a little bruise on his toes. Poor guy. But we got the braces in place and the glue worked perfectly to hold the front piece in place. It was exciting to take the clamps off the next day and see a beautiful counter ready to install. Another fun thing that happened since last week was I visited an antique shop that I haven't been to in years. It was so good!!! I found a pretty little white and gold vase, a cute peasant blouse for $9, some pages from a vintage poetry book for children that will make the BEST framed art for a kids room, and..... drum roll.... a vintage wash board with a glass panel that is SO PERFECT for my laundry room! It was the "something old" I needed in here. Lately I've realized that decorating is a lot like that saying about getting married. You need something old, something new (or a lot of things new), something borrowed (often from another room in your home), and something blue. ;) Almost always something blue. This week Dan and I are making a peg rail for behind the door and I'll be hunting for finishing touches in here. When I painted the walls I had to paint over our growth chart lines we had marked on the wall so I need to redo that as well. I can't decide if I want to make a project out of that or just write them back up there. There are some pretty cute ideas for growth charts out there... perhaps I'll get inspired to make one before the end of the challenge. 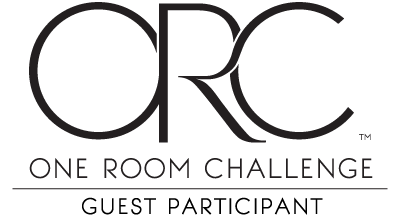 Be sure to stop by the One Room Challenge website to see the other designers' progress! You can get the link by clicking my posts title. Still haven't figured out how to make the link attached to the logo you see below, but I'll get there one day. lol Thank you for stopping by! I really appreciate the support!